Is this just another manic Monday? After such a long (seeming) and enjoyable weekend, I have the Monday blahs. How are you guys feeling? As for my weekend, I got to experience a proud older sister moment! 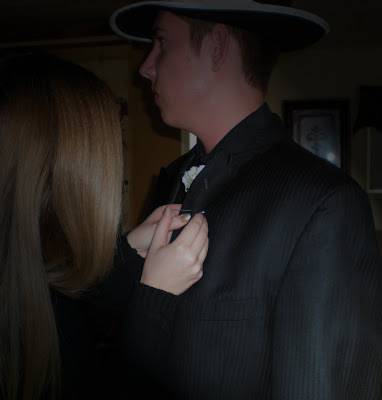 My little brother, Joey, went to his senior prom on Saturday, and I was there at my family's house to see him off. He and a group of his friends went "stag" and had a great time hanging out and dancing with the other single girls at the dance. I felt a little reminiscent and longed for my own high school days, but pushed those feelings aside to make room for the happiness I felt for Joey. He's about to graduate next week and has so much to look forward to! So exciting. Big sisters love their little brothers don't they? He looks very handsome. And guess what my youngest brother's name is Joey too. (His real name is Joseph-Paul). I love the little picture and the bed time story. Now if your boyfriend ever dreams and wants to know what the meaning may be. My dreams series started at A and I am now at W, so there may be something he has dreamt. You are a good Big Sis!! He does have some great days ahead, doesn't he?? what a cute blog!!! what a great pic! thanks for leaving a comment on my blog!! awww my little bro had prom a few weeks ago too! My brother's prom is tomorrow! I'm 10 years out of high school - crazy - and it's definitely making me sentimental for those "glory days". I can't wait to take photos of him all dazzling in his tux. Looks very sharp. Never had the prom experience in the UK, so always a bit of a mystery to me. Hope he had a good time. Congrats to yo bro by the way! My sister just had her prom. I was so proud of her. I can't believe she's already graduated! My little brother just had his prom too! And now he is graduating this week! Scary!! I know! We do have a lot in common! Congrats on your anniversary! I hope you have a fantastic weekend!